Beaver Island is the largest island in Lake Michigan and part of the Beaver Island archipelago in the state of Michigan. In 1856, it was home to a unique American religious colony monarchy (theocracy), under the self-appointed "King Strang," leader of the Strangite Mormon Church. Beaver Island was later settled by Irish Americans. The island is now a popular tourist and vacation destination. Beaver Island lies approximately 32 miles (51 km) from the city of Charlevoix, Michigan, on the mainland and is an unincorporated community located in Charlevoix County. The island can only be reached by air or boat. Beaver Island has two airports, one public and one private. The ZIP code is 49782. Beaver Island is also the name of an unincorporated community comprising the settled areas of the island. Although Beaver Island is known mostly today for its beaches, forests, recreational harbor and seclusion, at one time it was the site of a unique Mormon kingdom. 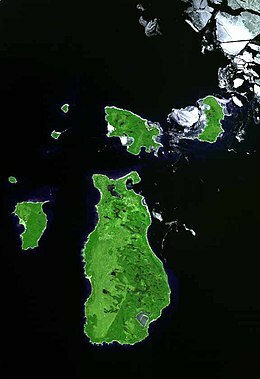 The island's association with Mormonism began with the death of Joseph Smith, founder of the Latter Day Saint movement. Most Latter Day Saints considered Brigham Young to be Smith's successor, but many others followed James J. Strang. Strang founded the Church of Jesus Christ of Latter Day Saints (Strangite), claiming it to be the sole legitimate continuation of the church restored by Joseph Smith. His organization still exists today (though not on Beaver Island), numbering up to 300 adherents. His group initially settled in Voree, Wisconsin Territory, in 1844, establishing a community there that remains to this day and is an unincorporated community within the town of Burlington, Wisconsin. 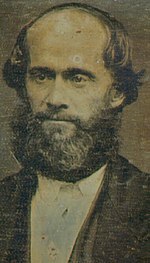 Seeking a buffer from persecution, Strang moved his followers from Voree to Beaver Island in 1848. The Strangites flourished under Strang's leadership and became a political power in the region. They founded the town of St. James (named after Strang) and built a road called "King's Highway" into the island's interior that remains one of its main thoroughfares. The Strangites cleared land, built cabins, farms and other improvements, and sought to establish themselves as a permanent presence on Beaver Island. Strang was elected to the Michigan House of Representatives in 1853 and again in 1855. He also founded the first newspaper in Northern Michigan, the Northern Islander. During Strang's stint in the legislature, he made Beaver the center of a new county: Manitou County included the Beaver Islands, Fox Islands, North Manitou, and South Manitou islands, with the county seat at St. James. 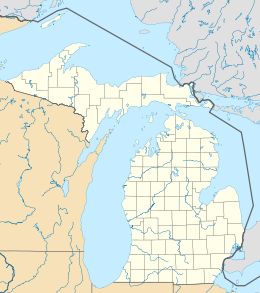 Manitou County was disestablished by the state of Michigan in 1895 (see below). Once established on Beaver Island, Strang declared himself a polygamist, a practice which he had previously opposed. He had five wives and fathered a total of fourteen children. In 1850, Strang proclaimed himself king, but not of the island itself. Rather, he claimed to be king over his church, which at that time contained most of the island's inhabitants. He was crowned on July 8 of that year inside a large log "tabernacle" built by his followers, in an elaborate ceremony that featured a crown (described by one witness as "a shiny metal ring with a cluster of glass stars in the front"), a red royal robe, a shield, breastplate, and wooden scepter. The Strangite tabernacle and Strang's house are both long gone, as are the Strangite royal regalia, but a print shop built by his disciples remains—the only Strangite building left on Beaver. Today, it houses a museum dedicated to the island's history. Strang and his followers often clashed with their non-Strangite neighbors on Beaver Island and adjacent areas. While claiming to be king only over his own adherents, Strang tended to exert authority over non-Strangites on the island as well, and was regularly accused of forcibly seizing their property and of physically assaulting them. Open hostility between the two groups frequently resulted in violence. Strangites were beaten by ruffians at the post office, while Strang once fired a cannon at an unruly group of drunken fishermen who had threatened to drive his people from the island. Strangites held an increasing monopoly on local government, blurring the distinction between church and state. While Strang held many progressive ideas such as the conservation of woodlands, his autocratic style of rule came to be seen by many as intolerable. One edict, for instance, dictated the type of clothing Strangite women must wear (see bloomers). Two women refused and Strang had their husbands flogged, a task made easier after one of them was caught in the act of adultery with the wife of his business partner. While recovering from their injuries, the husbands began plotting against Strang. On June 16, 1856, the US naval gunboat USS Michigan entered the harbor at St. James and invited Strang aboard. As Strang walked down the dock, the two men shot him from behind and then ran to the ship. The boat departed and disembarked the men at Mackinac Island without arresting them. Neither was convicted of the crime. After Strang died of his wounds on July 9, 1856, mobs came from Mackinac Island and nearby St. Helena Island and drove the Strangites (then numbering approximately 2,600 persons) off Beaver Island, confiscating their property. With the Strangites' departure, local government in Manitou County (including Beaver Island) all but ceased. Courts and elections were rarely held, county offices were usually unfilled, and the area acquired a lawless reputation affirmed by Michigan governor John J. Bagley in 1877 when he called for the county's abolition. A bill was introduced, but failed to pass. 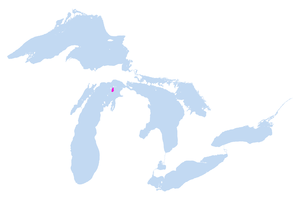 A new attempt in 1895 was successful, and the Beaver Islands became part of Charlevoix County while Fox and Manitou islands became part of Leelanau County. In addition to its murdered "king," Beaver Island would later become the home of two other persons who proved locally noteworthy. Father Peter Gallagher, priest from 1865 to 1898, was a colorful and charismatic leader, dominating island life and even getting into a fistfight with one of his parishioners in the island chapel. Feodor Protar, who arrived in 1893, was a disciple of Russian author and pacifist Leo Tolstoy. He served as a local doctor and friend-to-all while living as a recluse in a cabin in the island's interior. Protar died in 1925, leaving many admirers who would treasure his memory for decades to come. Logging, always an important part of the island economy, expanded greatly with the formation of the Beaver Island Logging Company in 1901. Docks, housing, railroads, and a mill transformed local scenery for a time, but fishing still remained the main concern. A steep decline in the fish population in the 1940s led to the exodus of most of the island's residents, until tourism in the 1970s brought renewed interest in Beaver. Today the island has become a popular vacation destination for people all over the Great Lakes area. Beaver is 13 miles (21 km) long, 3 to 6 miles (5 to 10 km) wide, and forms part of Charlevoix County, Michigan. It is mostly flat and sandy, with large forested tracts. According to U.S. census data, the island has 55.773 square miles (144.45 square kilometres) of land, and a year-round population of 657 at the 2010 census. The more densely settled portion, comprising only 6 percent of Beaver's total land area, lies within St. James Township on the northern end. This portion had a 2010 census population of 365 inhabitants. (St. James Township also includes Garden Island, High Island, Hog Island, and several smaller islands in Lake Michigan, all uninhabited on a permanent basis.) Peaine Township, taking up the remaining 94 percent of the island, contains sizable parcels of state-owned land which are managed as part of the Beaver Islands State Wildlife Research Area. The Research Area is mostly undeveloped, with some homesteads within the township descending from successful nineteenth-century farm clearings. The township, in 2010, had a population of 292 inhabitants. Beaver Island has several small to moderately sized lakes including Lake Geneserath in the southeast, Greenes Lake and Fox Lake in the central portion, and Font Lake, Egg Lake, Round Lake, and Barneys Lake in the north. There are only two named streams: Jordan River, draining into Sand Bay on the east side of the island and Iron Ore Creek, draining into Iron Ore Bay on the south side. This climatic region has large seasonal temperature differences, with warm to hot (and often humid) summers and cold (sometimes severely cold) winters. According to the Köppen Climate Classification system, Beaver Island has a humid continental climate, abbreviated "Dfb" on climate maps. A view of Iron Ore Bay on the southern end of Beaver Island. North Fox Island is visible on the horizon. Traditionally, the island's main industries have been fishing, logging and farming; but today, the economy revolves around government services, tourism, and home and cottage construction. Recreational opportunities abound in Beaver's harbor, beaches, inland lakes and the state forest, which covers much of the island. A golf course, nature trails, multiple restaurants and hotels, a marina and numerous other amenities cater to residents and tourists alike. Beaver Island bills itself as "America's Emerald Isle", partly reflecting the fact that many of its residents are of Irish descent. Central Michigan University owns and operates a research facility on the island, named the CMU Biological Station that offers classes and workshops for students as well as researchers throughout the year. Central Michigan University owns a former Coast Guard-owned Boathouse on Whiskey Point (north end of the island), the Biological Station, as well as a part of Miller's Marsh on Beaver Island. Beaver Island is served by two small airlines: Island Airways and Fresh Air Aviation. Planes are small 6–10 passenger propeller planes. The flight takes approximately 20 minutes. Flights are available daily and year-round, and reservations can often be made on short notice. Luggage is generally included in the ticket cost, with a "pounds per person" limit, and additional luggage charged by the pound. Dogs, cats and other pets are allowed, with ticket prices based on size. Island Airways' planes fly from Charlevoix to Welke Airport (6Y8), a privately owned public-access airport in Peaine Township approximately 1 mile south of St. James village. Fresh Air Aviation's planes fly from Charlevoix to the township-owned public airport (KSJX), farther down on the west side of the island, also in Peaine Township. Beaver Island Boat Company runs a scheduled auto ferry service from Charlevoix during most of the year. Daily service is available from May through September, and the ferry is closed from January through March. Voyagers are advised to check the weather before boarding, as rough waves can cause sea sickness for many passengers. Visitors wishing to bring their own vehicles must make reservations in advance. There are two ferry boats in service, The Emerald Isle, and the Beaver Islander, the latter of which is a smaller boat. The trip takes just over two hours, up to two and a half hours, depending upon the weather and which ferry is used. Dogs and bikes can be brought aboard the ferry for a fee. The Beaver Island Boat Company website lists detailed schedules, prices, and tips for travelling on the ferry. There are two lighthouses on Beaver Island. 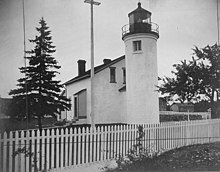 Beaver Island Harbor Light (St. James Light), built in 1870, on the north side of the island is still an aid to navigation. Beaver Island Head Lighthouse on the southern end of the island, built in 1858, was deactivated in 1961. Gull, Hat, Pismire, and Shoe islands form the Lake Michigan division of the Michigan Islands National Wildlife Refuge and are administered as a satellite of the Seney National Wildlife Refuge. Two of the islands—Pismire and Shoe—are also part of the Michigan Islands Wilderness Area. ^ The term "Mormon" as used here refers to James Strang's group, not the majority group that followed Brigham Young to Utah. Generally, this term is applied only to the latter sect. There is no affiliation between the two, beyond their common historical roots. ^ Depending upon the source consulted; see http://www.adherents.com/Na/Na_191.html. ^ (August 12, 1847). Voree Herald as quoted in Fitzpatrick, Doyle C. (1970). The King Strang Story: A Vindication of James J, Strang, the Beaver Island Mormon King. National Heritage. ISBN 0-685-57226-9, pp. 74–5. ^ *Weeks, Robert P. "For His Was the Kingdom, and the Power, and the Glory...Briefly." Archived September 29, 2007, at the Wayback Machine Article in American Heritage Magazine, Vol. 21, Issue 4, June 1970. ^ *Strang, James J. Ancient and modern Michilimackinac, including an account of the controversy between Mackinac and the Mormons. Interesting article from Strang's point of view. ^ "Archived copy". Archived from the original on May 17, 2008. Retrieved July 5, 2016. CS1 maint: Archived copy as title (link). ^ "Beaver Island History from the Beaver Island Historical Society". Retrieved November 8, 2016. ^ "Protar's House". Retrieved November 8, 2016. ^ a b "Profile of General Population and Housing Characteristics: 2010 Demographic Profile Data (DP-1): Peaine and St. James townships, Charlevoix County, Michigan". U.S. Census Bureau, American Factfinder. Archived from the original on September 11, 2013. Retrieved January 13, 2012. ^ "Beaver Island, Michigan Köppen Climate Classification (Weatherbase)". Retrieved November 8, 2016. ^ "MI ST James 4SSW Beaver". National Oceanic and Atmospheric Administration. Retrieved July 10, 2013. ^ "ST James 2 S Beaver IS, Michigan". Western Regional Climate Center. Retrieved July 10, 2013. Wikimedia Commons has media related to Beaver Island, Michigan. Wikivoyage has a travel guide for Beaver Island. Wikisource has the text of the 1905 New International Encyclopedia article Beaver Islands. Technology a blessing, a curse for remote island, By Martha Irvine, Associated Press, November 8, 2010. WVBI, the island's FM radio station. WVBI BIC Center Community Calendar, a on-line calendar of events on Beaver Island. This page was last edited on 10 April 2019, at 12:04 (UTC).